Beautiful certificate from the Poso Crude Oil Corporation issued in 1928. 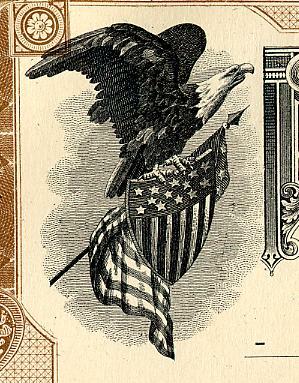 This historic document was printed by Stationers Corporation and has an ornate border around it with a vignette of an eagle with a union shield and an American flag. cut cancelled. reinforced. This item is hand signed by the Company's officers and is over 78 years old. 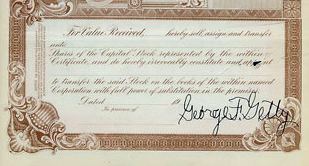 The certificate was issued to and signed by George F. Getty on the back. In 1904, attorney George Franklin Getty (1855-1930) moved his wife and son, Jean Paul, from Minneapolis to the Indian Territory (Oklahoma), where he began a career as an independent oilman. Within two years, Getty had amassed a fortune from his Minnehoma Oil Company and moved his family to Los Angeles. In 1913, Getty lent his 21-year-old son money to invest in oil wells. The young Getty made his first million by 1915, and the following year the father and son incorporated the Getty Oil Company, an early precursor to the great conglomerate. Although both men were successful in business, George was opposed to his son's personal lifestyle. George F. Getty was the husband of Sarah Getty and father of J. Paul Getty died in 1930. He left his estate valued at $10,000,000-$15,000,000 to Sarah in the form of the controlling interest in the family corporation, George F. Getty, Incorporated, although Jean Paul became President of the firm. .